A WorldVenture missionary's stained glass art portrays the biblical exodus and redemption story, one that's all too familiar to evacuees of Japan's 2011 tsunami and nuclear disaster. Throughout the centuries, humanity has used art to transcend the grim adversity of life. For one church in Japan, forced to evacuate after one of the most devastating tsunamis and subsequent nuclear disasters in history, the art of one WorldVenture missionary is doing just that: using stained glass windows to portray how the church’s believers have started to hope again. On March 11, 2011, a magnitude 9.0 earthquake struck near the northeastern coast of Honshu, Japan. The following 23-foot tsunami flooded about 217 square miles and compromised the cooling systems of the Fukushima Daiichi reactors. This triggered multiple explosions and a level 7 nuclear meltdown. Members of Fukushima First Baptist Church were among the local residents forced to flee from the ensuing destruction. Two years after evacuation, the exiled church members resettled in Iwaki, a city along the southern rim of the declared radioactive zone surrounding Fukushima Daiichi. The church is now 50 miles south of home, as close as safely possible. Church members pooled their resources to build an apartment complex and a chapel. 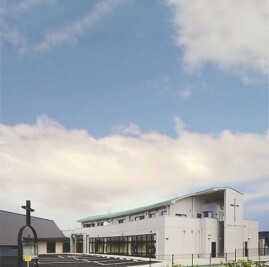 The new chapel is designed in the shape of a bird flying north towards the old chapel building near Fukushima Daiichi. Last fall, WorldVenture missionary Janet Brown completed a 14-month stained glass project for the new chapel of Fukushima First Baptist Church. Fukushima First chose themes that span from creation to Revelation, but they carry special meaning beyond the biblical stories. To many Japanese Christians, stained glass art is more than beautiful decoration. It marks a church with the blessing of God. But stained glass could easily cost a church over $5,000 plus the cost of materials to custom order. Janet has now made stained glass windows for six Japanese churches, all commissioned by word of mouth and only in exchange for the cost of materials. Janet sees each window as a teaching instrument, just as Europe’s medieval cathedrals used stained glass to share biblical stories with illiterate laypeople. For this reason, Janet does extensive research throughout the design process to make windows that are biblically accurate and help Japanese Christians share the gospel with visitors and seekers. WorldVenture missionaries, Frank and Helen Holecek, planted Fukushima First more than 60 years ago in a small coastal town of Japan. The church grew to 200 members since then and expanded into five chapels around the area. Later on, the Fukushima Daiichi Nuclear Power Plant was built within three miles of one of those chapels. For the new chapel’s first window, Janet tied the universal story of creation to the local story of Fukushima. She included a few of the city’s iconic symbols: a cherry blossom (Japan’s longest tunnel of cherry blossom trees was next to the old chapel building), loggerhead turtles (the turtles crawl onto Fukushima’s beaches to lay their eggs), and the Akita dog (one of the church’s pastors is from the Akita prefecture, where the dog breed of the same name originated). Even the church’s original chapel building is represented in the creation design. In the bottom right corner, the panel also features a lion and lamb lying next to each other. The church members of Fukushima First were among more than 200,000 residents initially evacuated from Fukushima after the tsunami and nuclear crisis. Pastor Akira Sato contacted as many of his church members as he could, and the majority dispersed to take refuge with family and friends around the country. However, 60 church members gathered in a crisis shelter and set out together for temporary resettlement. They would travel over 400 miles in 15 cars, part of the way through mountain roads walled by snow. The scenery reminded them of God parting the Red Sea for the Israelites’ safe passage out of Egypt. That’s why Janet’s second stained glass panel depicts Moses and the Israelites standing before a dry path through the Red Sea. Sato was surprised by the church’s strong faith in God. Instead of asking why they had to suffer, church members praised God for his protection through the tragedy. They continued worshipping together and studying the Bible. And God kept providing for the church members along the journey. The church spent a year at a retreat center and received aid from both Christians and non-Christians around the world. Sato recorded the church’s journey with a blog that was translated into six languages and had up to 200,000 hits per day. Local and international press interviewed the church about its story of survival and hope. The design for the third panel appeared fully formed in Janet’s mind while she listened to her pastor preach on Psalms 34 (“Taste and see that the Lord is good; blessed is the one who takes refuge in Him”). The panel shows the wings of God surrounding Jerusalem, with grains of wheat and grapevines bordering either side to symbolize the bread and wine of communion. Despite enduring tragedy, Fukushima First still celebrated communion with Christ and remembered His goodness. While Janet worked on the window, she prayed for a fellow WorldVenture missionary Bola Taylor, who had been diagnosed with terminal cancer. Evacuees of Tohoku, Japan, originally thought they would return home within days or weeks. However, Fukushima Daiichi was later called the worst nuclear crisis since Chernobyl in 1986, and the Japanese government estimates radioactive clean-up will take decades in the most contaminated areas. Decommissioning the Fukushima Daiichi plant won’t be completed for another 30 years. In other words, returning home is impossible for members of Fukushima First Baptist. Janet found this insight significant, and decided to depict the Japanese ancestral land to the Israelites’ Promised Land. The fourth glass panel shows God carrying the Israelites into Babylonian captivity, while Jerusalem burns in the background. According to Pastor Sato’s blog, the average Japanese church has 15 members. Before the 2011 disaster, Fukushima First’s attendance was approximately 200 people. Yet when the new chapel was dedicated in May 2013, the church prepared to host 400 attendees. By then, the chapel had already held two weddings, two memorial services, and one concert with 300 people in attendance. The church has seen other fruit as well. Just one month after the earthquake, one family asked to be baptized after evacuating with the church. Several women in the church had unbelieving husbands who worked at the nuclear plant and, upon relocating their families with the church, also accepted Christ. The fifth panel reflects the new life in Christ many Japanese are finding through Fukushima First after so much destruction and despair. Christ’s cross is seen on Calvary through the mouth of his empty tomb. The last panel is based on the description of heaven in Revelation 21 and 22. The Alpha and Omega symbols stand on either side of God’s throne. A river flows from the throne between streets of gold. The tree of life grows along the river with leaves for the healing of the nations. This is Fukushima First’s ultimate picture of hope. While the church cannot return to its previous home, the church is on a greater journey to a final home in heaven. Creating the stained glass panels drives Janet further into both Scripture and prayer for the window recipients. While Janet worked on the design for Fukushima First’s “Creation” window, Ephesians 1:4 inspired her to include a personal prayer for Fukushima. The final design features a heart around Earth to show God’s love for the people of Fukushima since before creation. The cherry blossom symbolizes new beginnings. So Janet prays for the Japanese people to be pointed to Christ, as the North Star points north. She prays they would find their way to Christ as baby turtles on Fukushima’s beaches claw their way to the ocean. And she prays those who find Christ would have peace and be devoted to God as dogs are known for their loyalty.